Yay, lots of good news this afternoon! 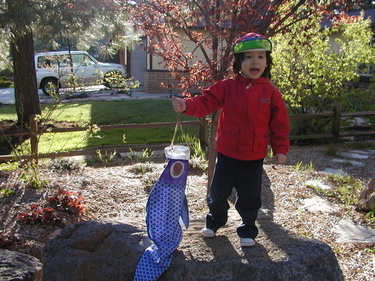 I finished Max's koi nobori, carp streamer. And a full 5 days before boy's day! (More on boy's day later.) This afternoon I sewed everything closed and put on the eyes. One small weirdness on the belly, but it's not bad and certainly passes the 5-foot rule (it's mostly hidden by fins). I made the eyes by fusing three successively smaller circles together using Wonder Under. I tried two techniques, fusing the 3 eye pieces together first then fusing the whole thing onto the fish face; and starting by fusing the largest circle onto the fish face, then the next smaller etc. For the record, the second method worked better. 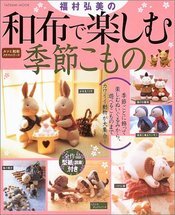 If anyone wants the pattern, let me know and I'll try scanning the pieces. The mouth is held open by fairly sturdy craft wire, which should allow the wind to flow through (if there is any wind). Max and I tested it this afternoon, and it seems to billow nicely (although not in the picture above). 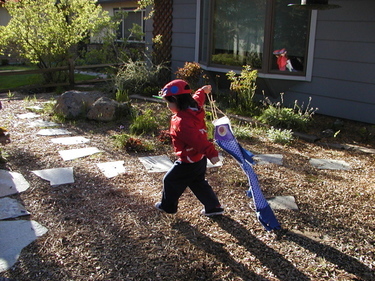 Max liked running around the front yard with his "fish kite". My other piece of good news is that I got my swap postcards in the mail today! I'm so glad that I don't have to draw them by hand now. They're a little overwhelmingly large, I got the 5x7 version but I think I should have gotten 4x6 instead. Oh well, that's ok, at least I'll have something to send tomorrow. 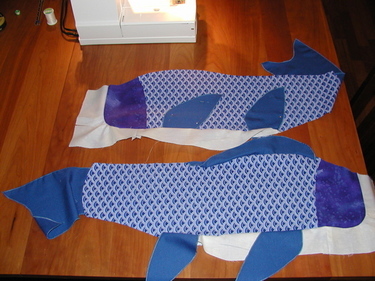 After getting over the serger hump, I was able to make much more progress on the koi. I re-did the two tail fins, because the serging at the interior corner hadn't actually caught the fabric and this annoyed me. So I redrew the pattern to be rounded rather than a sharp corner, rounds are much easier to do with the serger. Since the serger was still set up for the stitch, it was a breeze to just whip out some rolled hem pieces. Yay! I'm getting really close to putting it all together, probably will get to that today. I was getting pretty tired last night and wanted to stop halfway through the pinning of the white belly onto the second side, but I have this superstition (passed down by my mom) about leaving things in a non-symmetric state, so I had to sew the second side too. At least it puts me closer to finishing. Stephen has been put on notice that I'll need some way to hang this in our front yard. I suggested sinking a 15-foot bamboo pole next to our mailbox, he said he'd think about it a while and come up with a different idea, I guess he didn't like mine. Not that we could find a 15-foot bamboo pole here. 15-foot pine trees, yes, we already have those in the front. 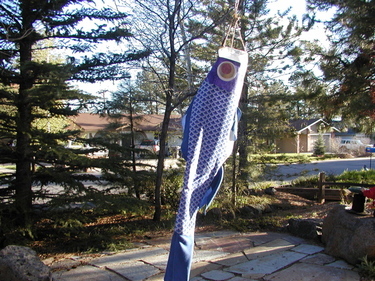 But the needles seem too harsh for the koi to be batting against. On a different note, I haven't gotten my postcards yet from the USPS!!! (For the postcard swap, whose deadline is tomorrow!) I'm starting to get nervous. Not that it's been overly long, I was pushing the timing on this. They shipped on Monday. But from where, East Nowhere Island? If they don't come today, I'll have to break out Max's crayons and get cracking... I hope they're here today! I had an unusual 3 hours to myself today, so I decided to finish Max's koi nobori (carp streamer). I had been drafting a pattern and finally finished it, plus I managed to pin and cut this morning. So three hours should be plenty of time, right? For the fins I decided to do a rolled edge with special sparkly thread I had gotten yesterday. And since I had just taken a 3 day, 9 hour course on my serger, I should be able to do this with no problem, right? Well, as you can guess, the answers to these questions is "no". Despite my 9 hours of serger study, I still managed to spend about 2.5 of my 3 hours trying to figure out how to do an acceptable rolled hem. It didn't help that I was using specialty thread, which usually requires tension adjustment. I finally backed off to plain ol' white thread, discovered and fixed my problems there (improperly seated needle, thread not staying in tension disks), then put the specialty thread in and had to do just minor tension adjustments. By the end of my work period, I had managed to put rolled-hem edges on all my fins: one dorsal fin, two tail fins, and four side fins. In the pictures you see all the fins, then a close-up of my hard-won rolled hem. Whew! I was pretty disappointed at my progress, as well as at my lack of ability to do a simple, d!@#$%! @# rolled hem after 9 hours of class! But then I realized that I had learned something: I was much better able to diagnose the problems this time. I know that 2.5 hours of diagnosing sounds like a lot, but before I had spent more time trying to figure out my machine. One day I'll be able to use it better, I hope. 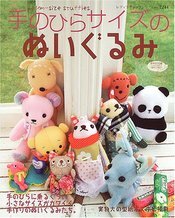 After Hillary's posting of her Japanese craft books, with ISBNs and how to buy them, I figured I'd slowly jump on the bandwagon as well. I'm glad to see that I'm not the only one who indulges in these! You can also check out Mariko's, Kelly's, and Maitreya's. Check out that last link for links to other listings. Note about yesasia: I couldn't get the ISBN search to work from anyplace except here. Just put the ISBN in the box (no dashes), and don't click on advanced search. I finally got around to making a needle case. I really needed one, because I was storing my needles in random little pieces of felt and stuck into the tops of thread spools, and therefore losing them quite frequently. This one has two views of Arizona: on the front is an ocotillo cactus with its red flag blooms on the top. On the back are pine cones, a more common sight in northern Arizona where I am. I'm feeling better now, and today for the first time in 4 days left the house. The first thing I did was to head to Michael's to get more floss colors so I could finish this. After reading about Susanne's trip to the post office and the answers to her questions about what kind of thing can be mailed, I gave up my fuzzy plans to do some sort of a sewed postcard for the swap. I vaguely remembered someone saying something about the USPS printing postcards, so I checked that out and decided to try it. Unfortunately, I don't have enough time to have them send me a test postcard first, so I just crossed my fingers and ordered 11. I had them sent to me, but I could have had them send them directly to the people on my list. Then they would have gone out on 25 April, rather than after whenever I get them from the PO, hopefully by 30 April. I hope these work out, otherwise my swap buddies may be getting hand drawn crayon creations, and I don't think anyone wants that! 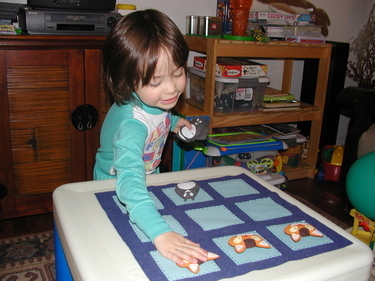 I finally finished Max's tic-tac-toe game! This is why I was making all those Totoros and cat busses. 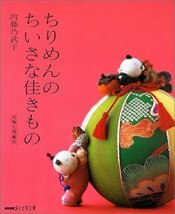 I got the idea from my latest Japanese craft book (more on that soon, I'm working on posting all my books like others have recently done). They had a board with rabbits and carrots. 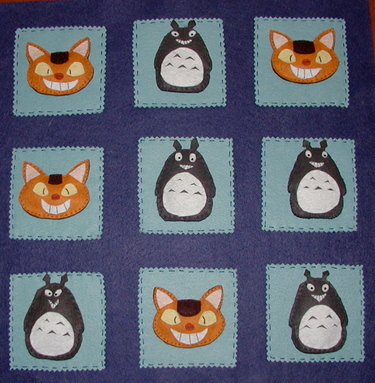 I thought Totoro would be a good idea, since Max is very much into Tonari no Totoro (My Neighbor Totoro). At first I was going to do Totoros and acorns (since they like acorns), but then I decided cat busses would be more fun than acorns. However, my first attempt at a cat bus wasn't quite right. I think it does look like a cat bus, but only if you already know what a cat bus looks like. (Those of you who haven't seen the movie are probably thinking "what on earth is a cat bus?" It's kind of like a stretch cat with many legs, that is also a bus. Totoros and small children can ride inside. Totoros are some sort of forest creature.) So I scaled back and went with just a cat face. I was just reading the IMDB trivia on this movie, and I learned that "Totoro" comes from Mei mispronouncing "to-ro-ru", or troll. 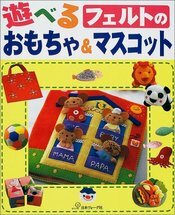 It says that this is explained in the Japanese language version, but not the English. I think that Totoro is much cuter than any troll I've ever seen in any storybooks. So here's what happened when the game was presented to Max. I explained that you needed to get three across to win. He seemed to accept that. So we played an easy game, where we each just put three down in a row and didn't interfere with each other. He liked that. This picture shows what happens when dad tries to put his piece in Max's row to block his three-across. Max just picked it up and put it back in dad's row! Ha! We didn't get to try much more because it was already past bedtime. Max and I have been sick with the cold that's going around town. 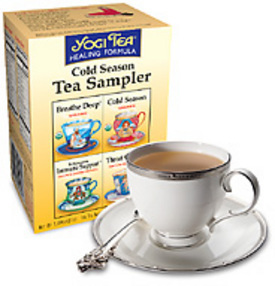 The teas in this cold season sampler are yummy and have been helping, at least a little. At this point, I'll take any little bit I can get. I know, I know, I've been doing much more talking about sewing than actually sewing, but things have been busy lately. I'm anxiously awaiting the time when I can get back to sewing... 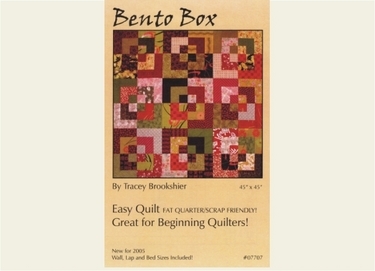 But in the meantime, while surfing on the FabShopHop—I never knew there were so many great quilting stores out there—I found this quilt pattern. Cute name, cute quilt. I'll have to remember this one! On an unrelated note: last week and the week before, I finally got around to taking a serger class. I've had my serger for ~3 years, but have been very frustrated with it. It takes forever to thread it and adjust the tensions for all 5 threads. I decided that I should take a class, so I signed up at the store where I bought it. I wish I had done this 3 years ago! Even though I "got" how it worked from the manual, there were lots of little tricks I didn't know. I think that playing with it for a while definitely helped me get more out of the class. The most important thing I learned is that the telescoping thread-holder-arm needs to be up all the way or else the thread will break. This was a big "Doh!" moment for me. Of course it has to be up. Why wouldn't someone put it up? Well, don't ask me, but at some point I decided it could stay down. That's when I had all the thread tensioning problems. So I'm feeling much better about my serger now! In two weeks we get to learn all about the cover and chain stitches. I'm so excited! 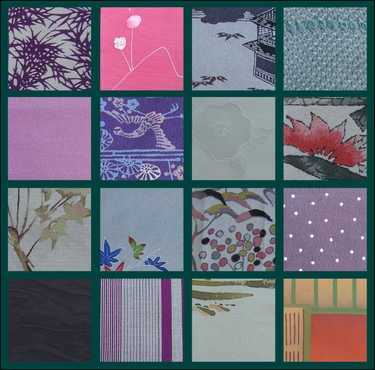 I especially like the upper left (purple pine needles) and upper right (green textured) fabrics. The only one I don't really care for is the lower right (orange/brown/green), the colors aren't my cup o' tea.